To the FDA, suppliers and other third party vendors are an extension of your organization, making regulatory compliance your responsibility. Outsourcing has become a global phenomenon among FDA-regulated manufacturers, making it absolutely critical to qualify new suppliers and manage quality on a routine basis. 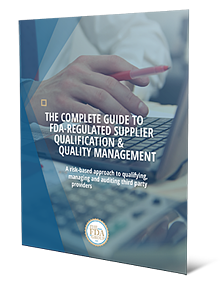 Grab our free white paper and learn how to build better relationships with qualified suppliers and establish a risk-based approach to supplier quality management.